You can watch for yourself here. The full video is here. I don’t care what your politics are, it’s nauseatingly racist. And what a disconnect. While Academy Award-winner and Obama supporter Tom Hanks and Eagles musician Glenn Frey parade around in the worst racial stereotypes imaginable, they mock Republicans. I guess they believe that inoculates them from bathing in open racism. Innis has also called on President Obama to remove Tom Hanks as narrator of the the recent propaganda film the White House just released. This is a story with legs and it should be interesting to see how Hanks, the White House, Hollywood and especially the media react. You know, the same media that declares the use of the words “basketball” and “food stamps” as racist. 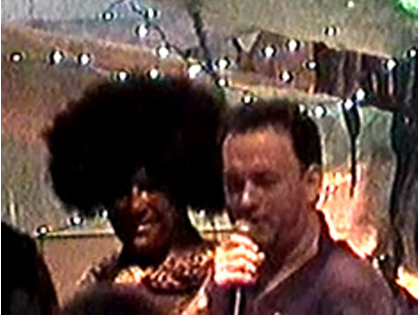 Video footage obtained by The Daily Caller shows Hollywood screen legend Tom Hanks and Eagles musician Glenn Frey at a 2004 fundraising auction, playfully interacting with a white man dressed as an African native, complete with blackface makeup and a giant Afro wig. Hanks most recently provided the narration for “The Road We’ve Traveled,” a 17-minute-long campaign video meant to help President Barack Obama win re-election in November. The fundraiser, held March 13, 2004 at St. Matthew’s Parish School in Pacific Palisades, Calif., featured Hanks and Frey as co-emcees. Children of both men attended the school. The event’s theme, “Castaways,” evoked memories of the 2000 film “Cast Away,” in which Hanks starred. The 2004 auction’s routine included a white man in blackface, identified in the footage as investment banker James Montgomery, CEO of the Santa Monica, Calif., firm Montgomery & Co. In addition to blackface makeup and the wig, Montgomery wore a leopard-print toga and an arm band made to look like it consisted of animal teeth. Over to you, racially-obsessed Lefties!